Nine people who made a difference to the community through their selfless contributions were honoured in a special ceremony held in Abu Dhabi on Monday. Abu Dhabi Awards, the emirate's highest civilian honour, were presented to the winners by His Highness Sheikh Mohamed bin Zayed al Nahyan, Crown Prince of Abu Dhabi and Deputy Supreme Commander of the UAE Armed Forces. In a ceremony held at the Al Bahar Palace, the Crown Prince praised the winners for their generosity and kindness that is inspiring. Having spent 50 years working in Abu Dhabi's health sector, Dr George Mathew, who is a UAE citizen, has had many close brushes with the late Sheikh Zayed. The doctor, who has won the Abu Dhabi Awards this year, was struck by the democratic values the great leader upheld while interacting with people. "His Highness' style of leadership was very democratic. When we used to meet him to discuss developments in the health sector, he would take into account all opinions," said Mathew, who is originally from Kerala. Dr Mathew came to Al Ain from Bahrain on May 30, 1967, to work as a general doctor. Mathew currently works as the advisor to the Ruler's Representative in Al Ain. Entry to Global Village is Dh15/person. And if you get lucky, you could watch a free concert on the main cultural stage with no extra money. The award in recognition of his contributions in developing the health sector of Al Ain, Dr Mathew says, is an honour he will cherish. "It is an honour to have won this award from His Highness Sheikh Mohamed, whom I have seen as a small boy growing up in Al Ain." If the best lessons of a country lie in its history, there are not many people who understands Abu Dhabi as Dr Jayanti Maitra does. A historian, who has tirelessly worked in documenting and developing the national archives of the emirate, the Indian expat from Kolkata won the Abu Dhabi Awards this year. "When I came to the UAE in 1982 to be with my husband, I was enamoured by the country that was laden in layers of rich history. "There was a general misconception that this country had not much of culture before the oil discovery. When I came here, I began to realise that there is a lot of history and heritage. That was the time astonishing archaeological discoveries were made about the maritime routes between the UAE and other countries that were pushing the history of the country back to thousands of years. And I got deeply interested in the subject," said Dr Maitra, who has authored two books that document the history of Abu Dhabi. Theban Salem Al Mheiri, a 48-year-old Emirati working with the Ministry of Interior who is also the General Secretary of the UAE Disabled Sports Federation, was recognised for his tireless efforts to help specially-abled people. 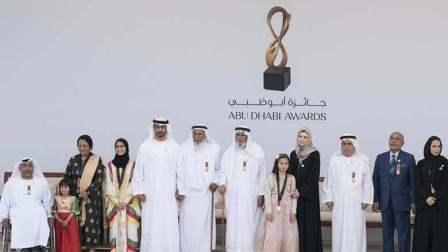 "I'm so happy for receiving this award from the Abu Dhabi government," said Al Mheiri. "This is a great honour to me and it has inspired me more towards helping people with determination." Al Mheiri is amongst the first UAE nationals to take part in sports for people with determination. Despite being partially paralysed due to a spine injury that resulted from a road accident back in 1994 while he was travelling to the airport to go for studies abroad, Al Mheiri has been involved in sports activities. "Using a wheelchair made me realise what people with disabilities go through. Since then, I have always been going to people with determination and those who have had accidents and cannot walk again, to help them." Sheikh Mubarak bin Qarran Al Mansoori, chairman of the Western Region Judicial Department's Conciliation Committee and a member of the National Consultative Council, was born in 1939 in Al Dhafra region of Abu Dhabi. He was awarded for helping people and promoting their welfare. Sheikh Mubarak was a great friend of the late Sheikh Zayed bin Sultan Al Nahyan and accompanied him throughout his youth. He worked alongside the father of the nation for more than 40 years. He was so pivotal in transforming lives of thousands of people. "I am so happy to receive this award. I thank Allah for this honour. I'm sure my great friend Sheikh Zayed would be happy seeing me receiving this award," said Sheikh Mubarak. "Sheikh Zayed liked to know people's problems and loved listening to people personally so he could help them. He always encouraged me to help people and to continue taking people with various problems to him." Winning the Abu Dhabi Award is not a personal victory for Ibrahim Abdulrahman Al Abed. An Emirati media veteran and currently Advisor to the National Media Council, Al Abed said the award is a recognition for every journalist who works in the UAE. "I do not consider this as an award that I personally won. Every journalist working in the UAE deserves this recognition. "There are hundreds of media organisations in the country. And there are journalists from different nationalities working here. They all contribute to the success of the UAE media industry by serving the general public by adhering to the values of peaceful co-existence and tolerance, welfare of people, by striking a balance between heritage and modernity." Dr Al Abed is the founder of the Emirates News Agency (WAM) until last year served as its the director-general. Al Abed graduated from the American University of Beirut with a major in political science and general Management. Emirati Farah Hashem Al Qaissieh, 28, is an assistant manager at Mubadala Emiratisation. She had grown up with a stutter, which impacted her ability to communicate with other people. She, however, managed to overcome this speech disorder after many years. And since then, she has been working hard to change how society views a person with stutter and hence recognised by the Abu Dhabi government. "I am so pleased and extremely overwhelmed by this award. It's a great honour being recognised by government for helping others," said Al Qaissieh. "This award has even motivated me all the more to see that I help more and more people with stutter so they can be able to interact with others." Farah decided to embrace stuttering and started every new meeting with peers telling them about her stutter problem. And because of a challenging childhood as a result of stutter, in 2013, Farah launched the "Stutter UAE" initiative.